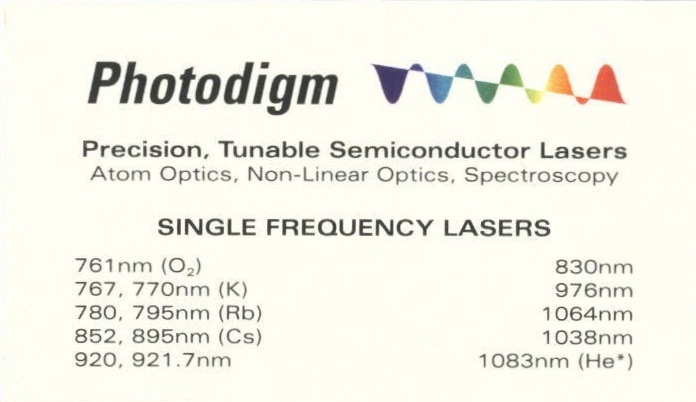 Precision DBR Lasers -- Products, not "Pearls"
Photodigm is a specialist producer of precision semiconductor laser diodes used in atom optics, spectroscopy, and metrology. One of our competitor’s websites describes their stock of optical miscellany as being a “large variety of wavelength selected laser diodes.” Furthermore, in colorful attempt to dress up the variety, they entice the reader to search for “pearls” among the stock. An interesting analogy, the pearl -- an abnormal growth, the valuable but unplanned result of an irritant to the oyster, if you stop and think about it. This competitor’s “pearls” presumably come about as parametric outliers of missed wavelengths, including look-ahead lots used to characterize epi as the desired wavelength is achieved. Whatever the source of these devices, they do not convey a commitment to provide products commensurate with their importance to their prospective customers. We at Photodigm do not look at our products that way. The back of our business cards says it all -- it displays an ever growing list of highly specialized products. Our monolithic semiconductor DBR lasers are characterized by single frequency beams, with a single longitudinal and spatial mode, certified to perform for applications requiring specific wavelengths, bandwidths, and critical performance parameters. We are continually developing and improving the performance of our products, and we are committed to delivering enabling technologies to our customers. When your need is for precision, contact Photodigm. We deliver products, not pearls.